Fiery confirmation hearings for Kavanaugh before the Senate judiciary committee concluded this week with accusations from the left that Kavanaugh perjured himself and accusations from the right that Democrats improperly released classified information. Susan Collins of Maine, who as a pro-choice Republican is seen as a possible defector in the confirmation effort, said on Friday she had not yet made up her mind. I know its frustrating to the press but until I finish my review Im going to defer my decision-making, Collins said. Republicans hold a 51-49 majority in the Senate. Under rules changes announced by majority leader Mitch McConnell in 2017, supreme court nominees can be advanced on a simple majority vote. A two-thirds majority was previously required. 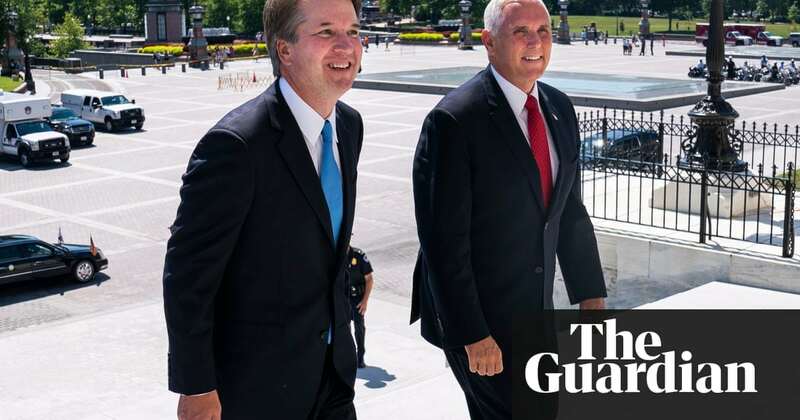 That means Pences constitutionally allotted power to break Senate ties might be used in an unprecedented and potent way, to install Kavanaugh in the seat vacated by retiring justice Anthony M Kennedy, thereby tilting the court to the right. Pence has cast tie-breaking votes in the Senate at a record-setting pace. He has intervened to confirm education secretary Betsy DeVos, to confirm ambassador Sam Brownback and to allow states to block funding for Planned Parenthood. Asked on CBS Face the Nation whether he would need to vote to confirm Kavanaugh, he said: Well, we hope not. Well see where we are. During his confirmation hearing, Kavanaugh was seen as evasive on the question of whether he would support a reversal of Roe v Wade, the 1973 ruling protecting abortion rights. Democrats also said Kavanaugh, a former lawyer in the George W Bush White House, sought to obscure his own positions on presidential immunity, racial profiling and other issues. Kavanaughs replies about his views on presidential immunity potentially significant in the Trump era were misleading, Democrats said. Ive never taken a position on the constitution on that question, Kavanaugh told California senator Dianne Feinstein. But according to former White House counsel Bob Bauer and Professor Ryan Goodman in a Just Security blogpost, Kavanaugh has written that the constitution seems to dictate that Congress not federal prosecutors can investigate a sitting president, and that the constitution appears to preclude prosecution of the president when in office. Brett Kavanaugh misled the Senate, Feinstein tweeted on Friday. Too many missing emails and too many questions about his trustworthiness. During the hearings, Cory Booker of New Jersey and Mazie Hirono of Hawaii released Bush-era correspondence from Kavanaugh stamped as committee classified, a low-level designation meaning Congress members and staff may view the documents but they may not be released to the public. Bookers emails pertained to racial profiling; Hironos pertained to federal protections for native Hawaiians. Bookers threat to release the emails prompted majority whip John Cornyn of Texas to read a rule stating that Booker could be dismissed from the Senate if he did so. Booker said he would gladly accept the consequences. Pence attacked Booker, though not by name. Judge Brett Kavanaugh distinguished himself, Pence said on Fox News Sunday. Many Democrats on the Senate judiciary committee embarrassed themselves. Another committee member, Nebraska Republican Ben Sasse, told CNNs State of the Union Washington had become a frenzied circus and he was thinking of switching registration to independent. But when asked what he thought of Donald Trumps performance as president, he began with praise for Kavanaugh. The president has done some good things, Sasse said. Kavanaugh is a really strong nominee I applaud the president for that pick. Next articleIt’s incredibly hard to get by as a contractor in America. It shouldn’t have to be.